The vector stencils library Bathroom contains 41 symbols of bathtubs, toilets, faucets, sinks, showers, bathroom furniture. 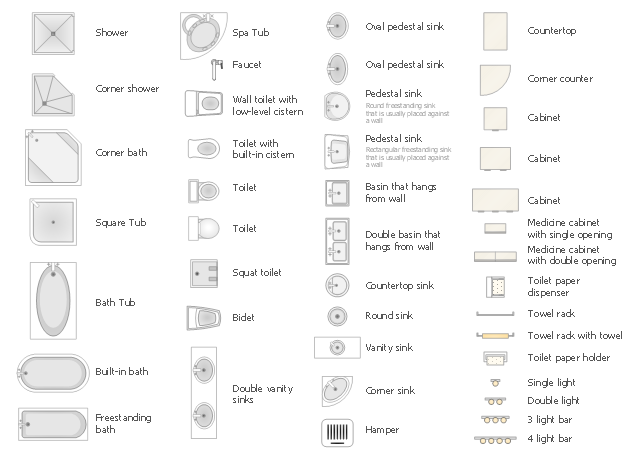 Use the shapes library Bathroom to draw the bathroom furniture and equipment layouts and bathroom interioir plans using the ConceptDraw PRO diagramming and vector drawing software. 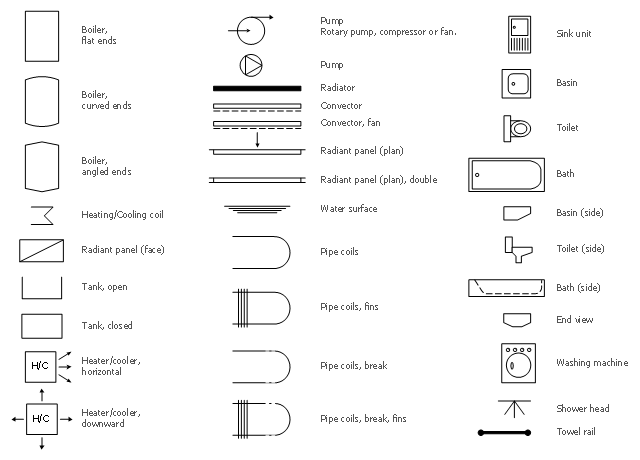 The vector stencils library "Plumbing" contains 32 symbols of plumbing components and bathroom fixtures. "Plumbing is the system of pipes, drains fittings, valves, valve assemblies, and devices installed in a building for the distribution of water for drinking, heating and washing, and the removal of waterborne wastes, and the skilled trade of working with pipes, tubing and plumbing fixtures in such systems. A plumber is someone who installs or repairs piping systems, plumbing fixtures and equipment such as water heaters and backflow preventers. The plumbing industry is a basic and substantial part of every developed economy due to the need for clean water, and sanitary collection and transport of wastes. Use the design elements library "Plumbing" for drawing plumbing and piping plans, schematic diagrams and blueprints of waste water disposal systems, and hot and cold water supply systems using the ConceptDraw PRO diagramming and vector drawing software.